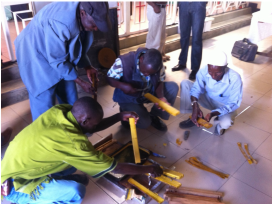 In mid-December we ran a beekeeping seminar for World Vision in a village they have targeted for agricultural developmental assistance. The name of the village is Ngarananyuki. The word "nyuki" means bee in Swahili and I assumed it was named after bees in some way. It is not so. Apparently Ngarananyuki means "place of the mineral water" in Kimaasai, the language of the Maasai people. 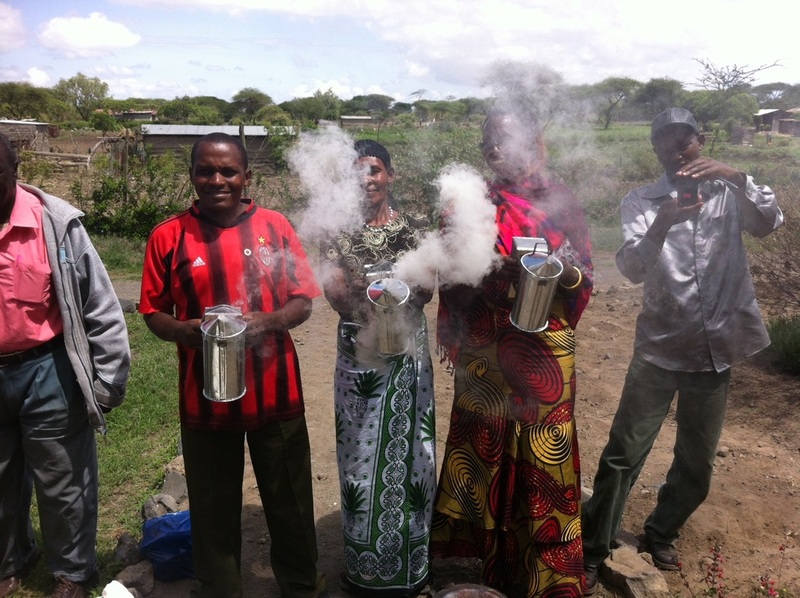 Regardless, the people living there were full of enthusiasm for Ufugaji wa Nyuki (beekeeping). There were 70 farmers present. Half of them kept bees before they came to the seminar and some of them have bee hives from their grandfathers that they own and harvest. It was a fun seminar as many of the farmers had a bit of previous knowledge regarding beekeeping. The farmers in this area farm tomatoes conventionally and farm a new kind of squash organically. Bees are big pollinators of the squash plants and can make a huge difference in regards to yield, in some cases 25-30 percent more fruit setting. This was the first seminar where we had genuine interest in pollination as well as honey production. The questions asked during the theory section were well thought out. Why do bees swarm and how can we control them? What is one way you can split colonies yourself? How do queens get bred? Where do they (queens) come from? The biggest question though, was how can you get 100 percent occupancy of an apiary? This is perhaps one of the best and most urgent requests of African beekeepers. Who wants to spend money to make and prepare 8-10 beehives if bees come to live in only 2 or 3 of them? That, in Africa, is a substantial investment no matter what kind of hives they are. The longer your bee hives stand empty, the slower you return your investment. The answer to this last question is by the use of Catcher boxes. Since African bees are only obtained by catching swarms of bees during the swarm season, baited hives need to be used. Most apiaries are located in one place. That means that 8-10 hives are placed in a field, or near a field, where the farmer has located good bee fodder or wants to pollinate the plants. The chances of bees occupying more than 2 or 3 of these hives is very rare. Bees swarm all over the forest and, because the hives are in one location, the swarms often do not come in contact with the baited hives. Therefore the use of mini-hives, called Catcher boxes, is necessary. Catcher boxes are small 5-bar hives. They are inexpensive to make, have one easily closed entryway, and are easy to move. The bars are identical to the ones in the apiary hives so that once bees occupy them they can easily be transferred into the full-size hives. The Catcher boxes are placed all over the forest during swarm season. Once bees occupy these hives they can then be relocated to the full-size hives in the apiary. Only with Catcher boxes can a beekeeper hope to obtain 100 percent occupancy in the full-size hives. 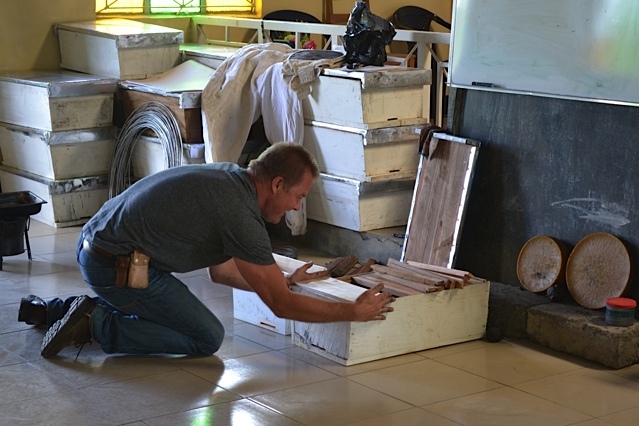 Teaching about bee space in an African hive. 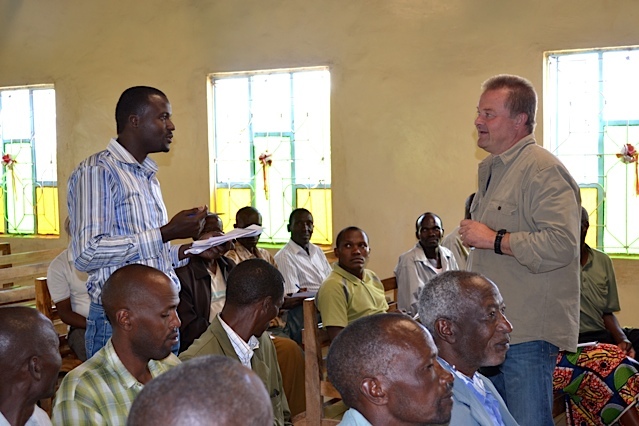 Good questions from participants at Ngarananyuki village, Arusha region. 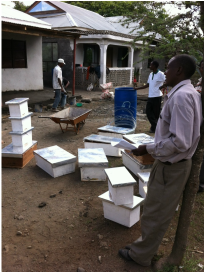 Delivering purchased beehives to one of the participants. 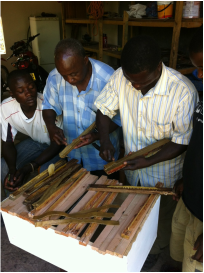 Demonstrating how to transfer bees from a catcher box to a top bar hive. Making starter strips and baiting a top bar hive. Seminar attendees making bees wax starter strips for inserting in the grooves in top bars. 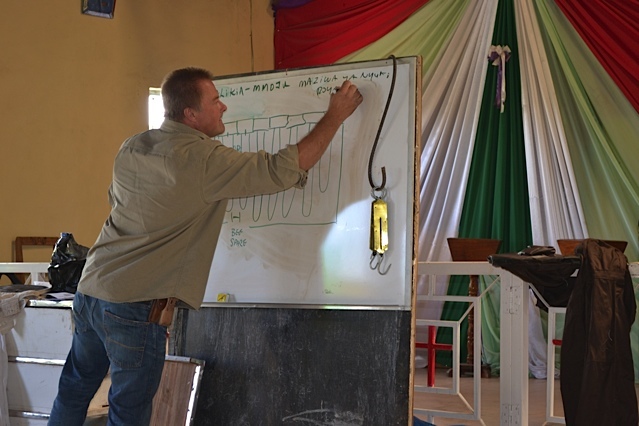 Ted teaching proper maintenance of bee hives.